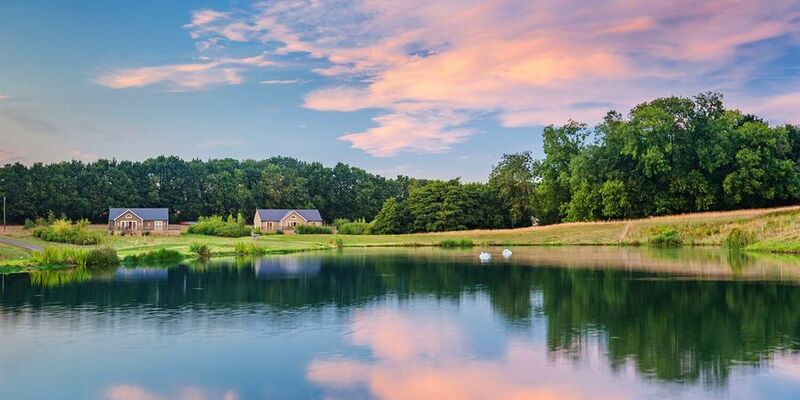 Our luxury 5 AA star self-catering lodge offers dreamy escapism deep within the rural seclusion of north Essex near Wakes Colne in the breath-taking Colne Valley. Lose yourself in the 500 acres of secluded rolling private land and wander the woodlands that can offer a decent game of hide and seek or a stretching preprandial ramble. While away some time by the magnificent two acre private fishing lake stocked with carp and rudd. A playground for wildlife, you may be lucky to catch a glimpse of a kingfisher. Your furry friends will love it too – the woods with its little stream are pooch perfect for sniffing and moseying about in. Set at the end of a mile long private driveway, our ultimate bolthole for couples or a family of four is tucked away in an ancient meadow in undulating countryside, where in decades gone by heavy horses, cattle and sheep would have grazed. Ransom Lodge was made for making memories. You’ll approve of the well-equipped kitchen, the very best of open plan living, the sumptuous en suite bedrooms and the state of the art technology. Outside on the south-facing veranda, the lake and woodlands serve the perfect backdrop. At night laze in the bubbling hot tub, clink your glasses and reflect beneath the stars with the distant sound of an owl in your ears. Ground floor accommodation: En suite bathroom to master bedroom with a a free standing bath and walk-in waterfall shower. En suite shower room to twin bedroom with walk-in waterfall shower WC cloakroom adjacent to the hallway. Ransom Lodge is just a stone’s throw from the historical viaduct at Chappel where there is a shop and post office and a picturesque pub beside the River Colne that serves locally brewed beer. So, whether you’re celebrating a special occasion, or just fancy a few days away from the hustle and bustle, why not unwind at Ransom Lodge in the tranquil beauty of the Colne Valley?